The tour is free but registration is required, as seating is limited. Please contact waf@shaw.ca to reserve space. The tour will begin at 227 Provencher Boulevard. Brutalist style buildings are some of the least liked and least understood of all architectural styles. Brutalism is a style that became popular during the 1960s and 1970s. It shifted the vocabulary of Modern architecture away from the lightness of design and the predominant use of glass and steel to buildings of heavy, rough, unadorned concrete. Often they were built for functions, such as jails, that stimulated negative feelings about the buildings. 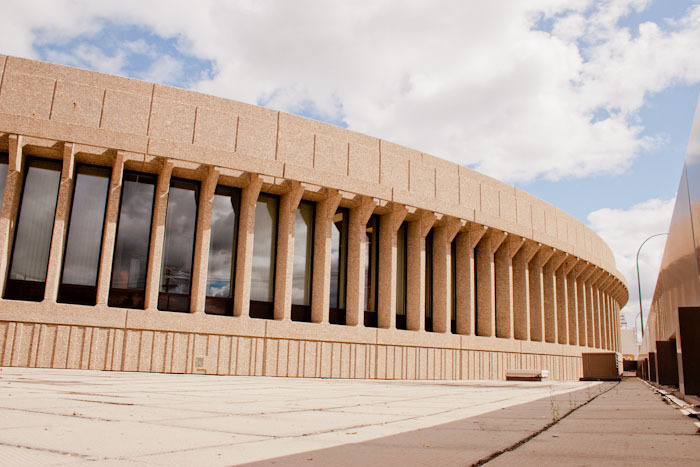 Join us for a tour (by bus) of Brutalist architecture in Winnipeg to learn about this style of architecture and its' history in Winnipeg. Form your own opinion about this controversial style.